Asked to complete this sentence on Tuesday, the four declared candidates for Vermont governor kept their answers crisp: “If you elect me governor, you’ll be really surprised at the difference that I will bring compared to the current governor in ________. 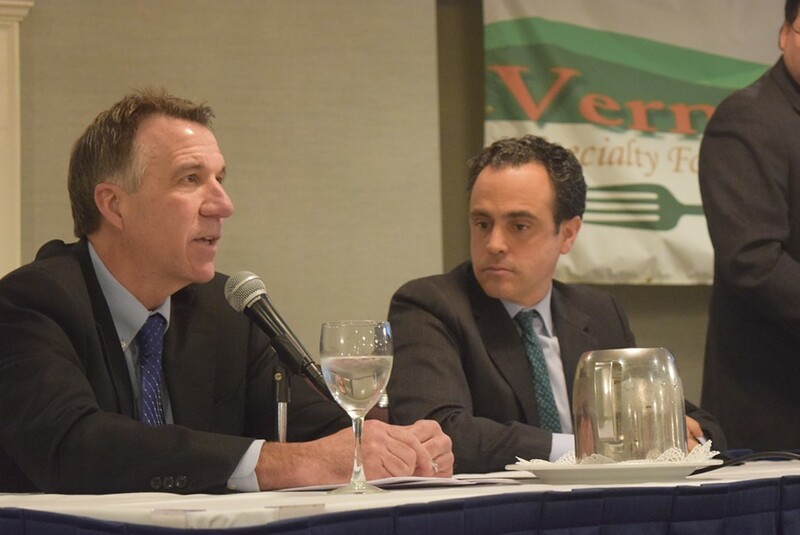 In a quick 25-minute forum sponsored by the Vermont Retail & Grocers Association, the candidates sought to distinguish themselves in front of a lunchtime audience of legislators and store owners. The two Democrats and two Republicans are vying for their parties' nominations in an August primary. 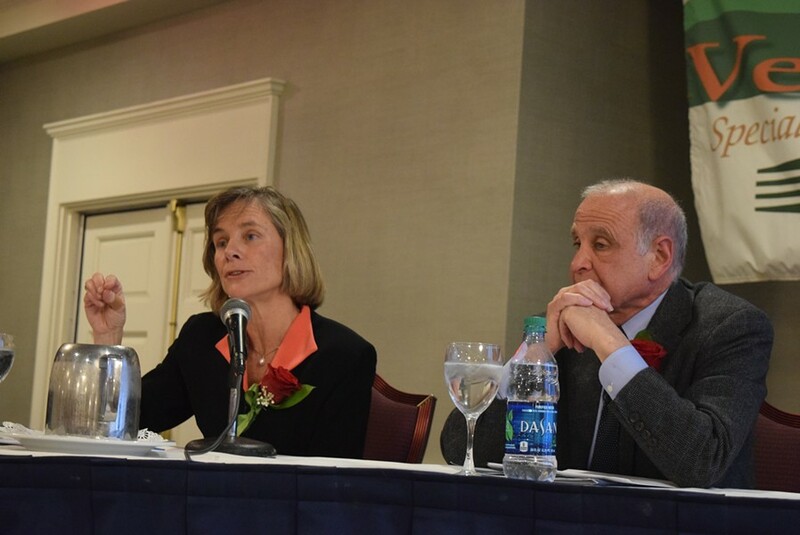 Former transportation secretary Sue Minter (left) and retired Wall Street executive Bruce Lisman at a forum for gubernatorial candidates. How does a $15-an-hour minimum wage sound? asked moderator Stewart Ledbetter of WPTZ-TV. Vermont's minimum wage today is $9.60. “We should be expanding the Earned Income Tax Credit, which gets to people below the poverty line who are actually working. Expand it to people without children,” Lisman said. 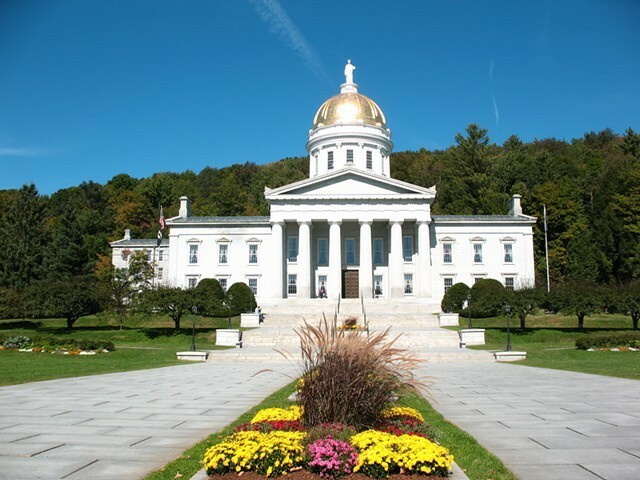 “It is clear that too many Vermonters are struggling to make ends meet. It’s because wages are not keeping up with the cost of living, so I do support a gradual increase in the minimum wage,” Minter said. Lt. Gov. Phil Scott (left) and former state senator Matt Dunne at a forum for gubernatorial candidates. On legalizing marijuana, Dunne sounded the most eager for passage. “I actually support doing it sooner rather than later,” he said, arguing Vermont should not wait to follow Maine and Massachusetts, which could hold public votes this year.